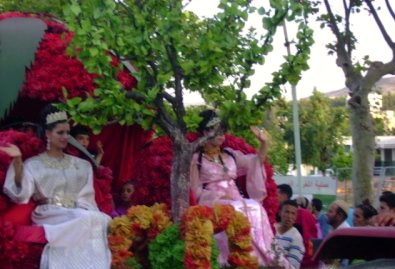 The June 2013 Sefrou Cherry Festival in Morocco, which celebrates the annual harvest, is the 93rd in its history and the first since its inclusion as part of the UNESCO immaterial cultural patrimony. The first Cherry festival held in Sefrou was In 1918. 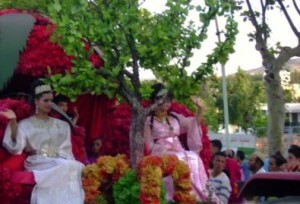 A cherry queen is crowned as a climax to street events and musical concerts. There will be exhibitions by cooperatives in the region to boost the local economy. Sefrou is a small ancient walled city, less than an hour’s drive from Fes in the Fes-Bouelmane region of the Middle Atlas Mountains. It ‘s simple white houses pre-date the 8th Century architecture of Fes. The Oued Aggal , a seasonal river divides the city in half, with small bridges a good 10 meters above the river to allow people but not cars to pass. The city is built on high ground to avoid the raging torrents. Sefrou, south of Fes, was once known as Little Jerusalem due to its high percentage of Jews and its well-developed religious life. Sefrou’s mellah makes up half of the old city. The mountainous terrain is ideal for cherry trees, flowering in spring, with abundant cherries in summer. The festival is a very colorful occasion featuring music, dancing a fairground and supporting events. The event reaches it climax with the crowning of the Cherry Queen. Sefrou is perfect for a day trip from Fes, and your riad or travel agent can arrange a trip to the festival which occurs each year in June.